It just doesn’t get more dramatic than this. In the everlasting dispute over ownership of the Bratz doll franchise, Mattel’s original $100 million verdict in the first trial is gone. Now Mattel gets a paltry $10,000 on an intentional interference claim and MGA Entertainment gets a whopping $88 million – still subject to trebling! – on a misappropriation of trade secret claim. I think there is some old saw about stones and glass houses . . . . 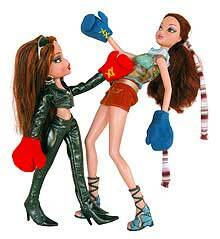 While the damages were awarded for misappropriation of trade secret, I’m mostly interested in the dispute over the ownership of the copyright in the Bratz doll and trademarks in the Bratz names. Where we last stood, the court of appeals held that designer Carter Bryant’s invention assignment agreement was ambiguous and the jury should decide whether he designed the Bratz dolls in the course of his employment with Mattel. The answer was “no,” according to the verdict form, which means that trademarks weren’t “inventions” and that Carter Bryant didn’t design the dolls “at any time during my employment” – but we don’t know whether it was because they were designed during his non-duty hours or because it was during a period when he was not employed by Mattel. And don’t forget how much this case has cost Mattel. “It means they wasted $400 million or so of shareholder money to get zero return,” reports MSN Money. Yowza. Expect to see some post-trial motions, followed on by appeals. This dispute is far from over. Mattel Inc. v. MGA Entertainment, Inc., No. CV 04-09049-DOC (RNBx) (C.D. Calif.).